We have asked everyone who has bought a PelvicToner from our website since October 2015, to complete a "One minute survey" on how they found the PelvicToner. And we are delighted with the response - read on to see why! Customer who answered our survey gave the PelvicToner a fantastic average rating of 8½ out of 10 across all users. 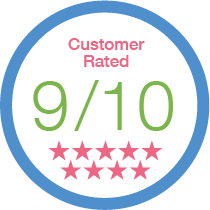 For customers who purchased their PelvicToner to treat Stress Incontinence, this went up to an amazing 9½ out of 10! 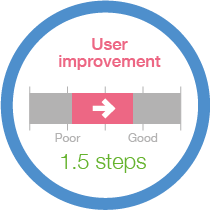 On the scale of Very poor > Poor > Adequate > Good > Very good, customers reported an average increase of 1½ steps. Customers who used it for Stress Incontinence achieved even more, with an average of 1.8 steps, moving from poor to good. An amazing 92% of customers said they would recommend the PelvicToner to a friend. We are very grateful for such an emphatic endorsement from our customers and very much hope you will take their advice. In addition to the numbers, we had some excellent feedback, which we'd like to share with you. Please tell us in your own words what you think of the PelvicToner and how it has helped you? 10 Bought because of Post hysterectomy & bladder complications. I found Your product the most easiest to use pelvic toner on the market with excellent results. I am a qualified nurse & Can not recommended this product enough! 10 It's a great help to train my pelvic floor whenever I want. I feel more secure now. 10 Given me more confidence when running for fitness. Now I don't leak! The more you use it the stronger your muscles become . 10 Well designed, easy to use, the hardest thing is remembering to use it. But it does work so worth it. 10 I have only been using it for four weeks or so and whilst I would like to think it is making a difference I think it is too early to tell. I do hope that it is as I have a very small prolapse and need this to work. 10 Before I was rushing to the toilet all the time, and sometimes only just making it, this has now stopped and it does not happen now only occasionally. 10 Easy and effective - have recommended it! 10 I would recommend this to all women, I have. I can now sneeze and cough standing up! no more tiny leaks. This is an essential exercise tool for all women of my age bracket, early fifties with two children. 10 Improves your control Of urinating and impious the elasticity of the Pelvic floor. A great product to own! 10 The reason I purchased the pelvic toner was that I had decided to take up running and was quite upset to find that I couldn't run without leaking urine. I had though I would have to start wearing pads when I ran and although I am 53 years old ( or young) found this a rather depressing prospect. Then I saw your advert in cosmopolitan and made a purchase. After 3 months of using the toner I can cough & sneeze without crossing my legs and I'm pleased to say I can also run without the need for pads. 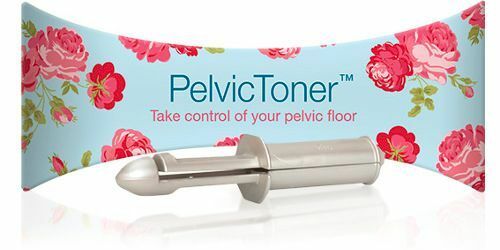 I would recommend the pelvic toner to anyone who has stress incontinence. I have told my sister about it & she has used my discount to purchase one, I can only hope her results are as good as mine. 10 See above for how it has helped. Easy to use and effective. 9 Very impressed easier to use than the Kegel I was using. 9 a reminder and the means to do pelvic floor exercises ! 9 The main advantage for me was the physical presence of the Pelvic Toner reminded to to do the exercises. 9 It's really improved things after childbirth. Thank you! 8 It has improved the tjne in my pelvic floor muscles. 8 It's still early days I have only been using it for two weeks, but I am more aware of the muscles I have to use. 7 It has helped me maintain my pelvic floor muscles after training from a specialist physiotherapist. 6 I think my prolapse has gone too far! 1 I have tried to use this product but I do not like it at all. - Developed an infection - doctor did not agree with introducing a foreign object into that area. Doctor did not recommend I continue use. - I was mortified that I had some urinary incontinence when standing from a seated position. Sometimes even the thought of needing to go to the loo brought on some leakage. I had contemplated surgery but now have put it on the back burner . * The figures and comments above are for customers who used their PelvicToner once or more a week using data collect until 17 May 2016. In the near future, we plan to give you live access to all of the anonymised results, but we need to do some technical work before we can do that. - when a customer said that they used their PelvicToner once or less a week, we feel this means that they did not give it a fair chance and are not in a position to judge whether or not it works. Otherwise, they results and comments published above have not been edited (except for the odd, obvious typo). Designed to help you do pelvic floor exercises as they should be done. More ..